Base of Operations: Europe mainly, occasionally worldwide. First Appearance: Unknown - possibly on his own website - address below. History: Adam Andros was the only child of his famous parents - his mother a European ambassador and his father a professor of palaeontology. As a youth he travelled the world with his parents, learning to cope with the adult social world from an early age. One result of this constant exposure to other cultures was to develop Adam's facility for languages - he became a polyglot. Three bizarre archaeological finds around Europe, all occurring at the same time, brought Adam together with Donna Eden. Donna had uncovered a tablet in Greece, which bore a message upon it purportedly from the Greek gods; Adam meanwhile had come upon a Welsh battleaxe during a cave in, which in spite of the different languages, otherwise carried the same message; and his father, up near Norway on a dig, came across a metal Viking longboat, also inscribed with an identical message! The coincidence was too much for the inquisitive minds of Adam and Donna, and it served to bring them together to try and solve it. But it also piqued the attention of Dr David Viderius (aka Dr D.Vider), a ruthless businessman, who wished to find out for himself the secret behind this mystery. 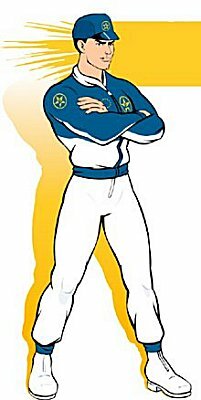 During the adventure that followed, Adam adopted the identity of Captain Euro. Now the two heroes work for the Twelve Stars Organisation, which has been set up to defend the security of Europe and uphold the values of the union.